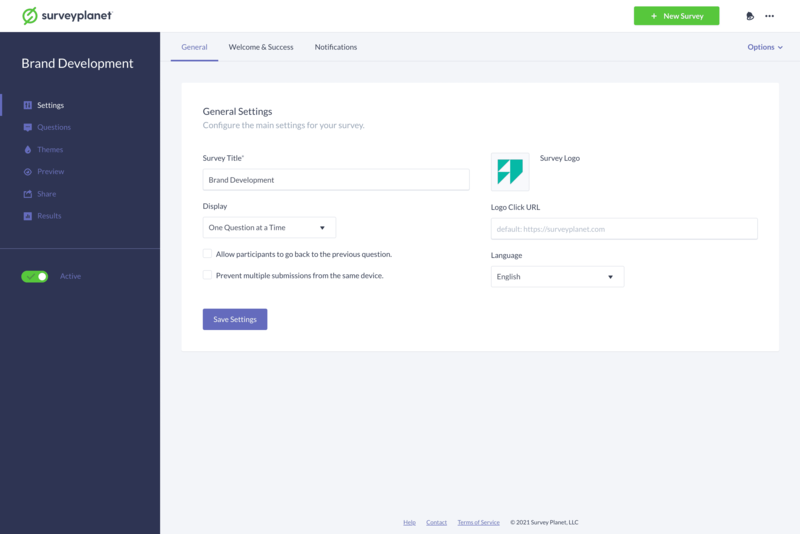 This is where you’ll configure the main settings for your survey such as your Survey Title, Display options, language and whether or not you want to prevent multiple submissions from users. For Pro users, you can add your Survey Logo here as well. The survey title is displayed at the top or your survey and is always visible no matter what question your participants are on. If you need to change your survey title after creating your survey, you can do it on the General Settings page. Once you have made this change, click Save Options at the bottom of the page. You can also change your Display options on the General Settings page. There are two options for displaying the questions to your survey: One Question at a Time and All Questions at Once. Showing only one question at a time shows a progress bar while participants take the survey. Click the drop down arrow under Display and select One Question at a Time. Once you have made this change, click Save at the bottom of the page. Showing all the questions on a single page allows the respondent to check their answers before submitting the survey. Click the drop down arrow under Display and select All Questions at Once. Important: If your survey uses question branching, you cannot display your survey questions all at once. You can choose the language of your survey on the General Settings page. There are 27 languages to choose from. Changing the language will change the default language on your survey’s buttons, instructions and alerts as well as the default opening and closing messages. You will need to type your questions in whichever language you’ve selected; SurveyPlanet won’t translate your questions for you. Also, pre-written survey templates are currently only available in English. Choose a language by selecting the drop down arrow under Language. Once you have made this change, click Save Options at the bottom of the page. You can prevent surveys from being taken multiple times from the same participant by clicking the Prevent multiple submissions from the same device checkbox on the General Settings page. This is by no means foolproof because SurveyPlanet utilizes cookies to remember who has taken the survey. It is possible that a participant can simply block or delete their cookies and take the survey again. On the General Settings page, click the gray image box below Survey Logo. Select an a previously uploaded logo from your Light Box or upload a new logo. Once the logo has uploaded, click the thumbnail to add it to your survey. To delete your logo click Clear. Type in the URL you would like linked to the Survey Logo in the Logo Click URL input field.